Ronnie came to Berlin, seeded n°14 and in real danger to have to qualify for the Crucible come April 2012. His last ranking title was the 2009 Shanghai Masters, some 2 1/2 years before. The 2010/11 season had been a disaster, especially the second half of it: from the UK Championship 2010 on and up to the China Open 2011 Ronnie had lost every first round match he had played. He was very low in confidence, private life circumstances were not great and it got to the point that he had decided to withdraw from the World Championship 2011 even if that meant the end of his career. WPBSA however offered him the opportunity to think again about it, and Ronnie, realising how massive a decision this would be, decided to give the World Championship a go AND, very importantly, accepted the suggestion from his then manager, Django Fung, to see Dr Steve Peters. This proved to be a career changing decision. He reached the quarter finals in Sheffield, losing to John Higgins the eventual winner. It was plain to see that his game wasn’t in great shape, but his attitude and application were exemplary. 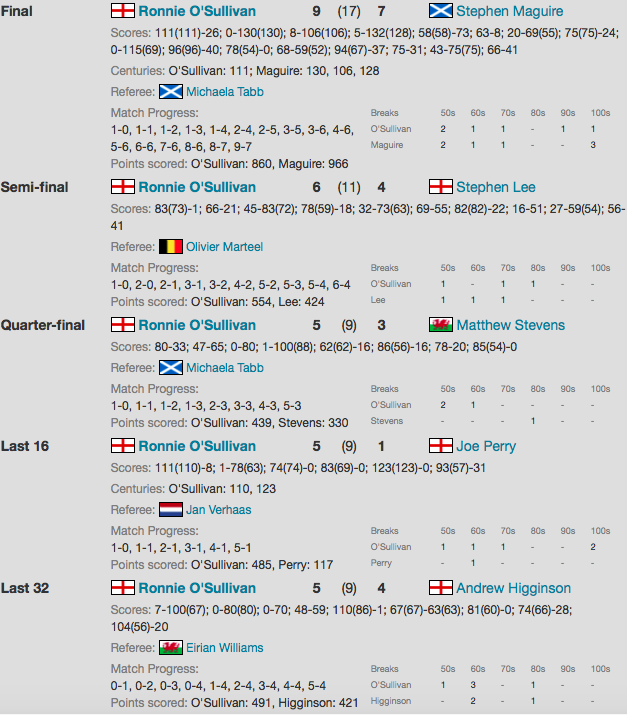 The 2011/12 season started with mixed results: on one hand he entered a lot of the PTCS, reaching the final in 4 of them and winning 2, on the other hand the results in the main events were not great and he badly needed ranking points. To make things worse, a bad bout of glandular fever hit him shortly before the UK Championship 2011 and affected him for the best part of the winter and spring. The German Masters started with a big scare: in the last 32, Ronnie found himself 0-4 down to Andrew Higginson; he battled back but in frame 6 Andrew had a big opportunity to win the match, and, had he done that, maybe the great run Ronnie had in 2012/13/14 would never have happened. But Andrew snookered himself on the last red, effectively frame and match ball, Ronnie won the frame and the match and went on to win the tournament. Ronnie wasn’t safe yet, ranking wise: it’s only after the Welsh Open 2012 – where he reached the semi finals – that he was able to relax knowing the would be seeded at the World Championship 2012. As so often in his career, with his back against the wall, he had found the resources he needed when it mattered most. As we know, he won his 4th World Championship in May 2012 and the rest is history.